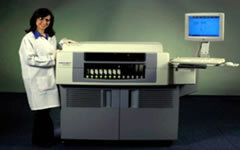 ARCHITECT i2000SR can be integrated with the ARCHITECT c8000 or ARCHITECT c16000 to consolidate clinical chemistry and immunoassay on one platform. Two i2000SRs can be connected to form a high-speed i4000SR. 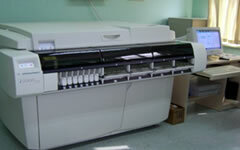 The ARCHITECT i2000SR provides immunoassay testing with increased sample and reagent capacity. he ARCHITECT i1000SR analyzer is one of the newer immunoassay members of the ASRCHITECT Family of Instruments, sharing all the proven benefits of other members of the Family. 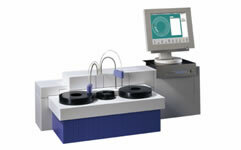 The system is designed for lower-mid volume laboratories and for integration with the c4000 chemistry analyzer. The i1000SR offers labs the agility to free them from their everyday workload issues. The AxSYM processes up to 120 tests per hour while providing continuous access, random access, and STAT processing with a broad testing menu. AxSYM allows medium volume clinical laboratories to process a variety of immunodiagnostics tests simultaneously, as well as adding tests while the instrument is running. Proven and modern technology meeting all your needs: reliability, flexibility, , convenience and economy. 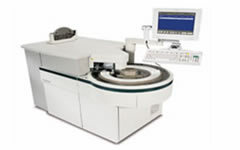 The design features and specifications make the Selectra-E a true all-round analyser. As a main system, as a back-up system, for routine chemistry of up to 300 tests per hour with ISE unit, the Selectra-E does the job without compromising quality. The Selectra-XL is a true open and cost effective system that, among others, runs all chemistries that have been adapted for the Selectra family. Clinical Chemistry, Special Proteins, Drugs of Abuse, Therapeutic Drugs, Electrolytes. 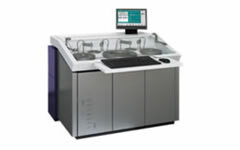 The Selectra-XL is the ideal work-station as main system, back-up system or for specialties, having a throughput in the range of 400 tests per hour.